Are you feeling like I was away for a month rather than a week? Sometimes my recaps are like that. Just a couple more days and we're home. But... they were full days and maybe my favorite days of our holiday. On Day 4 we took a little breather. We wanted to walk on the beach, the one sitting just on the other side of the cliffs at the edge of our resort. The beach was accessed via wooden steps built into the very steep hill side. The Atlantic is wild and rugged here. It pounds the shoreline and there are places you can see where the mountain has literally moved. Thankfully not while we were on it. ahem. The highest wave ever ridden by a surfer happened just up the coast and there's a crazy photo of it here. We did not ride the waves. I almost accidentally rode a wave, but it wasn't 100 ft. and it only soaked me up to my shorts. The surf came up a lot closer to the rock than it appeared from a distance. And it was fa-ree-ZING! Decided this plan had the potential to go awry, and I might end up on the nightly news as the tourist swept out to sea because she was doing something stupid. Whoohoo! I lived to tell the tale-ha! After our beach adventure mama needed to lie down. The sun was brilliant and the air just right so we planted ourselves beside the pool for a couple of hours. Delightful. 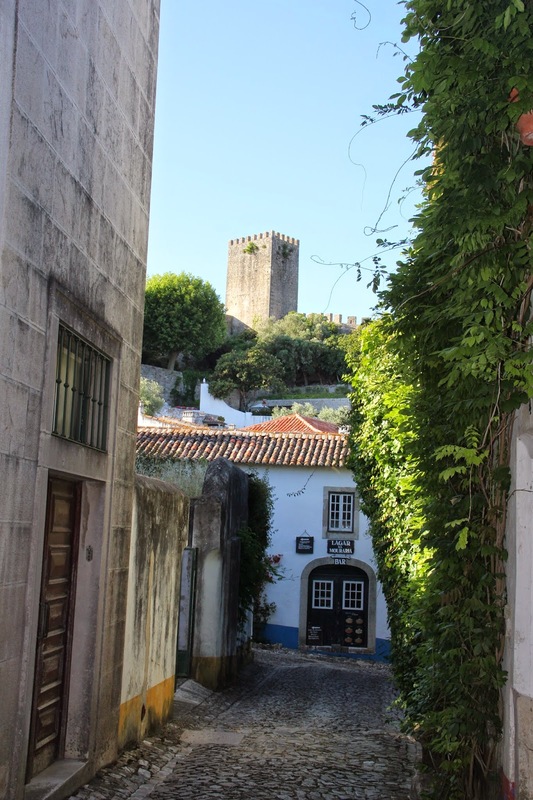 Later that afternoon we drove a few miles down the road to the nearby medieval city of Obidos. Enchanting! A storybook hilltown encircled by a wall dating back to the 14th century. The construction is impressive. Somebody had to haul an awful lot of rock sans bulldozer and forklift back in the day. Lots of somebodies I imagine. Way back in 1282 King Dinas presented this charming little village to his beloved Isabel as a wedding present. You enter through a gate whose underneath side is dressed in colorful tile. FYI-beautiful tile is everywhere you turn in this country. Once inside the city walls the narrow streets wind and climb, and flowers spill out of window boxes and up the sides of ancient white washed buildings. There are shops and restaurants and churches, and a castle turned hotel. You can also climb up onto the wall and walk the sentry path, so up we went. And along much of the wall along one side, there's no railing. Yup, open all the way to the ground, some 50 feet below. In some places you can crawl climb more cobbledy cobbled steps also without a railing, and go even higher. Not nervous at all. Ha! And to make it more 'exciting' it was gusty up there! Hubs wanted me to climb into this space in the wall which in essence was like climbing into a wind tunnel. If you look closely you'll see me peeking out of the rampart. Hubs kept shouting for me to 'lean out a little further'. My stomach kind of flip flops just writing about it. We walked the entire way around, and some parts were less terrifying than others. When I had to press myself against the wall so a dad carrying a baby on his shoulders could pass by I told hubs we had to climb down. I did not want to witness him stumbling with that baby. Seriously dad! Come on! Not smart! We were meeting up with the rest of our group for dinner in one of the restaurants and it was such a cute spot. Low beamed ceilings, stone walls, and wonderful local cuisine. The perfect ending to a perfect day. I love the way it makes me feel to walk in these old cities. To think about the people who built them and how very different the world is today. The way time, for just a little while, stands completely still. Thanks for sharing your trip. It sounds absolutely delightful. I love your bravery with the waves and the wind tunnel. :) I also love that your hubs takes the camera now and then. :) Have a great weekend! I have soo enjoyed traveling along with you on this trip! Soo amazing. I can only just imagine how fun it must have been. I am NOT the adventuresome type, but I do enjoy watching others enjoy it. Climbing up those stairs I am not sure I could have done, lol. Soo glad you got to enjoy it all. What fun it's been traveling along with you. I just don't think I could have done the climbs ... I don't do heights. Just reading about your adventure gives me a bit of the heebie jeebies! Well, I have only been to Europe once, Italy, and I can say that I had some of the same feelings in the old cities. I love putting my hand on the ancient walls and trying to feel some of the energy from so many years ago. Thank you for taking the time to take us along with you on this wonderful trip!! I'll look forward to the next few days!! Looks like a great trip. When traveling "the other side of the pond", I too am always amazed at the amount of work it took to build all of those villages, walls and castles on top of all of those mountains. The last trip to Italy, I "accidentally" came home with a piece of mortar from the coliseum and several mid evil castles. I will never tell how I acquired them! Love this! Well, all except the wall. Not sure I could have done that. But I enjoyed seeing your pictures! What a lovely day this must have been. I love that little cosy cave like restuarant. How neat! I am an explorer so i would love to walk all along the edges,etc. like you did. I want to see the inside of that castle turned hotel. I bet that had interesting pieces in it.